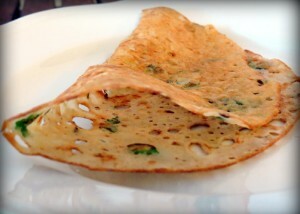 Rava Dosa: Rava Dosa or ravvattu or rave dose is a crepe from South India. It is made with a batter of semolina, rice flour and water alongside various spices like cumin seeds, salt, asafoetida, diced onions, diced carrot, curry leaves, cashew nuts, dark pepper, hacked cilantro and green chillies. The blended mixture is then poured hot oiled tava utilizing a spoon as a part of a roundabout movement. At that point, oil or ghee is sprinkled around the dosa and it is cooked for around two minutes till golden crisp. Rava Dosa is presented with an assortment of chutnies or sambar. Take all the ingredients, except oil, in a bowl. Mix well to make the rava dosa batter. Keep aside for 30 to 40 minutes. Heat a non stick tava on medium heat. With a ladle pour the batter from the edges of the tava towards the center. Grease the rava dosa with oil. Cook till the dosa becomes golden colour and starts leaving the pan. When both the sides are cooked, remove the dosa from the pan. Rava dosa is ready to be served. Serve the hot rava dosa with coconut chutney or sambhar. If you have any queries regarding the Rava Dosa recipe, please leave a comment.